Flat Delivery Fee & FREE Delivery on orders over $95! 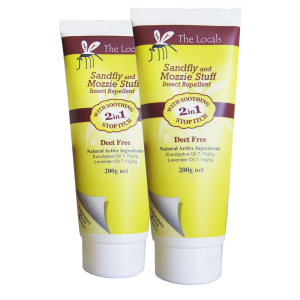 The Locals are an Australian based business that provides a fantastic range of products to protect against sandflies (midges) and mosquitoes, which you will find available within this section. Each of the various types of mosquito bite prevention and stop itch products can be purchased today at competitive prices. If you prefer to carry around a single product with you while on the go, we also provide our repellent and stop itch body lotion and spray in singular bottles that fit easily within backpacks. Or for the convenience of a single application our box of twenty 10g sachets of lotion are handy to slip into any handbags or pocket. After taking a look at the different sandfly and mozzie insect repellent products we have to offer at The Locals, make sure to have a read through our story to find out more information about how and why the brand started, we are proud of our products which are all free from DEET.